We are an exploration stage company that intends to engage in the exploration of mineral properties. We have acquired a mineral claim that we refer to as the Queen Claim. Exploration of this mineral claim is required before a final determination as to its viability can be made. The Queen Claim is located approximately 75 miles north-west of the central British Columbia city of Prince George, and approximately 40 miles west of the town of McKenzie. 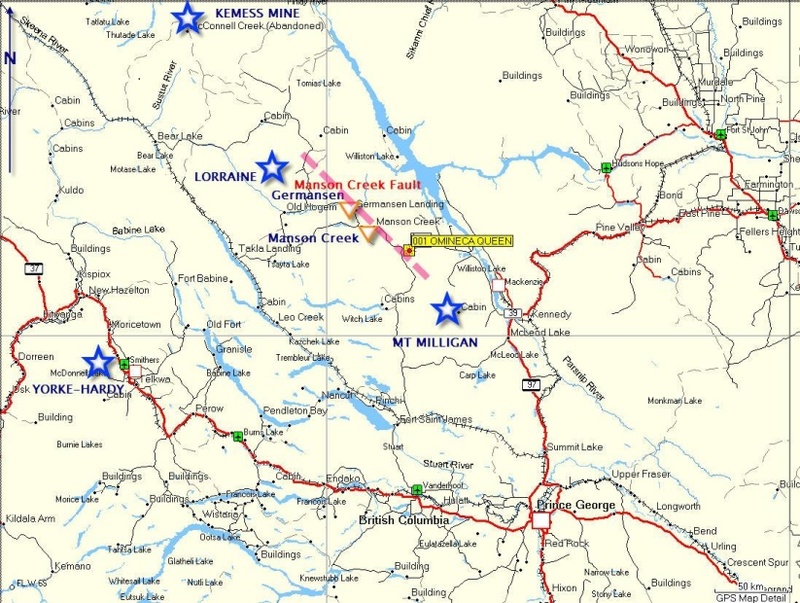 Access to the property is by way of logging roads, approximately 3 miles south of the MacKenzie – Kemess Mine Road. An electric power line follows the MacKenzie – Kemess road. Our business plan is to proceed with the exploration of the Queen claim to determine whether there are commercially exploitable reserves of gold or other metals on the claim. We intend to proceed with the initial exploration program as recommended by our consulting geologist. Phase I of the recommended geological program cost us a total of $16,685 and has been paid to our mineral property operator during the early part of 2009. Phase I consisted of on-site surface reconnaissance, mapping, sampling, and geochemical analyses. The field work portion of this program has been completed and we have received the geochemical analysis and our geological consultants’ report on Phase I of our exploration program. As of the date of this report, however, our board of directors has not had the opportunity to review the report and decide on a course of action. Phase II would entail further on-site surface reconnaissance, mapping, sampling, geochemical analyses and backhoe trenching based on the outcome of the Phase I exploration program. The Phase II program will cost approximately $16,000. We anticipate commencing this phase in the Spring of 2010. The budget for Phase III of our exploration program is tentative in nature as the actual exploration program to be undertaken will depend upon the outcomes of the Phase I and Phase II exploration programs. Phase III of our exploration program, if undertaken, may commence in the spring or early summer of 2010, and will consist of laying out grids over the mineral claim, trenching, further sampling and assaying, a geophysical program, and the diamond drilling and drill core sampling of ten, 1,000 foot holes. It is currently estimated that Phase III will cost approximately $210,000. The existence of commercially exploitable mineral deposits in the Queen Claim is unknown at the present time and we will not be able to ascertain such information until we receive and evaluate the results of our exploration program. The Queen Claim is comprised of 23 cells of approximately 50 acres per cell. The Queen Claim is held 100% by Barry Price. The claim, Title # 574763, covers approximately 460 hectares. The entire area enclosed by the mineral claim is approximately 1,136 acres, or approximately 1.8 square miles. The claim is in good standing with the Province of British Columbia until January 27, 2012. In order to extend the expiry dates of a mineral claim, the British Columbia government requires either (1) completion of exploration work on the mineral claim valued at an amount stipulated by the government and the payment of a filing fee; or (2) payment to the Province of British Columbia an amount equal to the combined value of the exploration work stipulated and the filing fee in lieu of completing exploration work to maintain the mineral claim. When exploration work valued at an amount stipulated by the government is completed and a filing fee is remitted to the Province of British Columbia, the expiry dates of the mineral claim can be extended for a maximum of 10 additional years. In the event that no exploration work is completed and a filing fee is paid to the Province of British Columbia in lieu of completing exploration work, the expiry dates of the mineral claim can be extended for a maximum of only one additional year each year. Under the terms of the Property Option Agreement between Mr. Barry Price and IRC, our wholly owned mining exploration subsidiary, we acquired an option to acquire an 85% interest in the Queen Claim. Under that Agreement, we paid Mr. Price an initial sum of $1 to acquire the option and are required to make the following payments in order to exercise that option: $1,875 (CDN$2,000) upon the execution of the POA (which we have paid), $1,842 (CDN$2,000) prior to July 31, 2009 (which is payable as a promissory note), and an additional $46,045 (CDN$50,000) prior to July 31, 2010. These payments are personal fees charged by Mr. Price. In addition, we must incur the following amounts in exploration expenditures in order to exercise our option: $14,157 (CDN$15,000) prior to July 31, 2009 (which we have met); $28,833 (CDN$31,000) in aggregate on or before July 31, 2010; $222,222 (CDN$241,000) in aggregate on or before July 31, 2011. We can exercise our option at any time prior to July 31, 2011 if we complete aggregate payments of CND$54,000 to Mr. Price and incur an aggregate of CDN$241,000 in exploration expenses on the Queen Claim. We will either satisfy the payment terms of the Property Option Agreement in the time frame provided, thereby resulting in us exercising this option or we will fail to satisfy the payment terms and be in default of the Property Option Agreement. If we are in default of the Property Option Agreement, the optionor can terminate Property Option Agreement if we fail to cure any default within 45 days after the receipt of notice of default. Our option will expire if we are in default of the Property Option Agreement and fail to cure any default within 45 days after the receipt of notice of default. Under the Property Option Agreement, we will acquire an 85% interest in the Queen Claim and Mr. Price will hold the remaining 15% interest if we exercise our option. Mr. Price is the operator of the Queen Claim, and as the owner of the mineral claim, he is responsible for maintaining the mineral claim in good standing with the B.C. Mineral Titles Branch. Mr. Price is responsible for conducting the exploration activities on the property in accordance with the Mitchell Geological Services Inc. Geological Report, dated August 4, 2008. Between research, mobilization, demobilization and a site visit, Mr. Price is expected to expend one to two weeks for the first year exploration phase and additional one to two weeks during the second year exploration phase. The amount of Mr. Price’s time required past these phases cannot be determined at this time. Upon the completion of both the first and second year exploration phase, we intend to request that our consulting geologist, Marvin Mitchell, review the results of the exploration program and report back to us with recommendations, if any, with regard to further exploration programs. Further phases beyond the first and second year of our exploration program will be dependent upon a number of factors such as Marvin Mitchell’s recommendations based upon ongoing exploration program results and our available funds. In the event that we exercise our option, the Property Option Agreement requires that we, and a sole purpose company to be formed by Mr. Barry Price, will enter into a formalized joint venture. We have not entered into such an agreement at the present time and the terms discussed herein are a discussion of the expected terms of such proposed joint venture agreement. In the event that Mr. Price chooses not to remain as the operator of the Queen Claim, and provided that our board of directors and the recommendations of our consulting geological firm favors further exploration, we intend to seek out a candidate with similar qualifications to those of Mr. Price and form a new joint venture with such persons or parties. The purpose of the proposed joint venture will be to further explore the property containing the Queen Claim with the eventual goal of putting the property into commercial production should both a feasibility report recommending commercial production be obtained and a decision to commence commercial production be made. The feasibility report refers to a detailed written report of the results of a comprehensive study on the economic feasibility of placing the property or a portion of the property into commercial production. It is possible that results may be positive from the exploration program, but not sufficiently positive to warrant proceeding at a particular point in time. World prices for minerals may dictate not proceeding. Due to the fluctuation in the prices for minerals, it is also possible that mineral exploration ventures may not be profitable resulting in our inability to attract funding from investors to finance further exploration. Under the terms of the proposed joint venture agreement, both parties agree to associate and participate in a single purpose joint venture to carry out the project. Beneficial ownership of the property remains in each party’s name proportional to its respective interest. Subsequent to the initial exploration program costs that we will bear, future costs are to be met by each party in proportion to its interest. If we exercise our option and the joint venture if formed, our initial interest in the joint venture shall be 85% and Price’s company to be formed, which we refer to as “Priceco,” will be 15%. The interest of each party may be reduced and the other party’s interest increased by an amount equal to the share of the exploration costs they would be obliged to pay. If the interest of either us or Priceco is reduced to less than 5%, then that party will be deemed to have assigned their interest to the other party, and their sole remuneration and benefit from the proposed joint venture agreement will be a Royalty equal to 2½% of the net profits. The respective interest of each party in the joint venture could be increased or decreased form time to time if any or all of the following events occur: (1) a party fails to pay its proportionate share of the costs; (2) a party elects not to participate in the program, and/or; (3) a party elects to pay less than its proportionate share of the costs for a program. If these terms operate to cause a party’s interest in the Queen Claim to be reduced to 5% or less, that party will assign and convey its interest to the other party and will receive a royalty equal to 2.5 % of the net profits of production. The Property Option Agreement provides that Mr. Price, as the initial operator, will have the same rights, duties, and responsibilities in the event that he was the operator under the proposed Joint Venture Agreement. The operator has the full right, power and authority to do everything necessary or desirable to carry out a program and the project and to determine the manner of exploration of the property. A management committee consisting of one representative of each party will oversee the operator and manage or supervise the management of the business and affairs of the joint venture. Each representative may cast that number of votes that is equal to that party’s interest. A simple majority of the management committee prevails and the management committee’s decisions made in accordance with the proposed joint venture agreement are binding on all parties. The proposed Joint Venture Agreement contemplates that the agreement will stay in effect for so long as any part of the property or project is held in accordance with the agreement, unless earlier terminated by agreement of all parties. We selected the Queen mineral property based upon a geological report prepared by our geological consultants firm. In the report, authored by Marvin Mitchell, P.Eng., it is recommended that we launch an initial exploration program on the Queen Claim which cost us $16,685 for Phase I (first year) of the exploration program and $16,000 for Phase II (second year). The terms of the Property Option Agreement require us to incur an additional $210,000 in mineral exploration expenses on the Queen Claim prior to July 31, 2010. We have engaged the services of Mitchell Geological Services Inc. as our consulting geologist’s firm. Mr. Marvin Mitchell, P.Eng., of that firm has prepared a Geological Report on the Queen Claim. Upon the conclusion of both our first and second year exploration programs, we will engage the services of our consulting geologist to review the findings of exploration on the Queen Mineral Claim and to make recommendations, if any, with regard to future exploration programs. Our consulting Geologist, Mr. Marvin Mitchell, is a graduate of the University of Montana’s Montana School of Mines where he obtained a Bachelor of Science in Geological Engineering (mining option) in 1968. He is a member of the Association of Professional Engineers and Geoscientists of British Columbia. He has practiced his profession continuously for the past 40 years. The property that is the subject of the Queen Claim is undeveloped and does not contain any open-pit or underground mines which can be rehabilitated. There is no commercial production plant or equipment located on the property that is the subject of the mineral claim. There is no power supply to the mineral claim. Our exploration program is exploratory in nature and there is no assurance that mineral reserves will be found. The details of the Geological Report are provided below. and is located at geographic coordinates Latitude: 55 deg 31’28’’N, and Longitude: 124 deg 06’36’’W. It is located about one-half mile upstream on Barite Creek where Barite Creek flows into the Manson River, and is to the south of the Manson River. The highway from the town of MacKenzie, located about 40 miles to the west, to the Kemess Mine, located about 50 miles to the northwest, runs along the north shore of the Manson River where the two streams join. An electrical power line follows the road. The terrain is mountainous and the vegetation is typical of the central portion of the Province of British Columbia. There are extensive stands of Fir, Hemlock and Spruce, parts of which have been harvested while major portions of the Spruce forest have been killed by recent infestations of the Spruce bud worm. The logged areas are approximately 12 years old and are extensively covered with small bushes, shrubs and juvenile trees, all of which appear to be products of natural re-seeding. Barite Creek flows through the mineral claim. The claim is located about one-half mile upstream from where Barite Creek flows into the Manson River. The occurrence was first discovered and staked in 1966. The Province of British Columbia owns the land covered by the Queen Claim. Currently, we are not aware of any native land claim that might affect the title to the mineral claim or to British Columbia’s title of the property. Although we are unaware of any situation that would threaten this claim, it is possible that a native land claim could be made in the future. The federal and provincial government policy at this time is to consult with all potentially affected native bands and other stakeholders in the area of any potential commercial production. If we should encounter a situation where a native person or group claims an interest in the Queen Claim, we may choose to provide compensation to the affected party in order to continue with our exploration work, or if such an option is not available, we may have to relinquish any interest that we hold in these claim. As owner, it is Barry Price’s responsibility to keep the Queen Claim in good standing with the Province of British Columbia. Prior to the expiry dates, Mr. Price plans to file for an extension of the Queen Claim. In order to extend the expiry dates of a mineral claim, the government requires either (1) completion of exploration work on the mineral claim valued at an amount stipulated by the government and the payment of a filing fee; or (2) payment to the Province of British Columbia in lieu of completing exploration work to maintain the mineral claim. Currently, an exploration work value of approximately $1,840 is required during each of the first three years after the Queen Claim was acquired and an exploration work value of approximately $3,680 is required in subsequent years. In addition, we must pay a cash reporting fee of $0.16 per acre every time a report is filed. A maximum of ten years of work credit may be filed on a claim. Incurring $241,000 in exploration expenses will result in an extension of the expiry dates of the mineral claim for the maximum of 10 additional years provided that a report and filing fee of approximately $184 is remitted to the Province of British Columbia. In the event that no exploration work is completed and a filing fee is paid to the Province of British Columbia in lieu of completing exploration work, the expiry dates of the mineral claim can be extended only on an annual basis into perpetuity for a maximum of only 1 additional year. If the required exploration work expenditure is not completed and filed with the Province in any year or if a payment is not made to the Province of British Columbia in lieu of the required work within this year, the mineral claim will lapse and title with revert to the Province of British Columbia. In order to evaluate the exploration potential of the Queen claim, our consulting geologist has recommended on site surface reconnaissance, mapping, sampling, and trenching to be followed by geochemical analyses of the samples to be taken. The primary goal of the exploration program is to identify sites for additional mineral exploration. Phase I of the recommended geological program cost us a total of approximately $16,685 and has been paid to our mineral property operator during the early part of 2009. Phase I consisted of on-site surface reconnaissance, mapping, sampling, and geochemical analyses. The field work portion of this program has been completed and we have received the geochemical analysis and our geological consultants’ report on Phase I of our exploration program. As of the date of this report, however, our board of directors has not had the opportunity to review the report and decide on a course of action. Upon our review of the results, we will assess whether the results are sufficiently positive to warrant additional phases of the exploration program. We will make the decision to proceed with any further programs based upon our consulting geologist’s review of the results and recommendations. In order to complete significant additional exploration beyond the currently planned Phase I and Phase II, we will need to raise additional capital. Most companies operating in this industry are more established and have greater resources to engage in the production of mineral claims. We were incorporated on June 4, 2008 and our operations are not well-established. Our resources at the present time are limited. We may exhaust all of our resources and be unable to complete full exploration of the Queen Claim. There is also significant competition to retain qualified personnel to assist in conducting mineral exploration activities. If a commercially viable deposit is found to exist and we are unable to retain additional qualified personnel, we may be unable to enter into production and achieve profitable operations. These factors set forth above could inhibit our ability to compete with other companies in the industry and enter into production of the mineral claim if a commercial viable deposit is found to exist. If we progress to the production phase, production of minerals in the Province of British Columbia will require prior approval of applicable governmental regulatory agencies. We cannot be certain that such approvals will be obtained. The cost and delay involved in attempting to obtain such approvals cannot be known in advance. The main agency that governs the exploration of minerals in the Province of British Columbia, Canada, is the Ministry of Energy and Mines. The Ministry of Energy and Mines manages the development of British Columbia's mineral resources, and implements policies and programs respecting their development while protecting the environment. In addition, the Ministry regulates and inspects the exploration and mineral production industries in British Columbia to protect workers, the public and the environment. The material legislation applicable to IRC is the Mineral Tenure Act, which is administered by the Mineral Titles Branch of the Ministry of Energy and Mines. The initial phase of our exploration program will consist of the assay analysis of rock samples and a geological ground survey. The practice in British Columbia under this act has been to request permission for such a program in a letter to the B.C. Ministry of Energy and Mines. Permission is usually granted within one week. Should the Phase II exploration program be undertaken, it would be intended to refine information garnered in the first phase employing the same methods of exploration. The B.C. Ministry of Energy and Mines administers the Mines Act, the Health, Safety and Reclamation Code, and the Mineral Exploration Code. Ongoing exploration programs likely will be expanded to include activities such as line cutting, machine trenching and drilling. In such circumstance, a reclamation deposit is usually required in the amount of $3,000 to $5,000. The process of requesting permission and posting the deposit usually takes about 2 weeks. The deposit is refundable upon a Ministry of Energy and Mines inspector’s determination that the exploration program has resulted in no appreciable disturbance to the environment. The Mineral Tenure Act and its regulations govern the procedures involved in the location, recording and maintenance of mineral and placer titles in British Columbia. The Mineral Tenure Act also governs the issuance of mining leases, which are long term entitlements to minerals, designed as production tenures. At this phase in the process, a baseline environmental study would have to be produced. Such a study could take many months and cost in excess of $100,000. All mineral exploration activities carried out on a mineral claim or mining lease in British Columbia must be in compliance with the Mines Act. The Mines Act applies to all mines during exploration, development, construction, production, closure, reclamation and abandonment. Additionally, the provisions of the Health, Safety and Reclamation Code for mines in British Columbia contain standards for employment, occupational health and safety, accident investigation, work place conditions, protective equipment, training programs, and site supervision. Also, the Mineral Exploration Code contains standards for exploration activities including construction and maintenance, site preparation, drilling, trenching and work in and about a water body. Additional approvals and authorizations may be required from other government agencies, depending upon the nature and scope of the proposed exploration program. If the exploration activities require the falling of timber, then either a free use permit or a license to cut must be issued by the Ministry of Forests. Items such as waste approvals may be required from the Ministry of Environment, Lands and Parks if the proposed exploration activities are significantly large enough to warrant them. We will also have to sustain the cost of reclamation and environmental remediation for all exploration work undertaken. Both reclamation and environmental remediation refer to putting disturbed ground back as close to its original state as possible. Other potential pollution or damage must be cleaned-up and renewed along standard guidelines outlined in the usual permits. Reclamation is the process of bringing the land back to its natural state after completion of exploration activities. Environmental remediation refers to the physical activity of taking steps to remediate, or remedy any environmental damage caused such as refilling trenches after sampling or cleaning up fuel spills. Our initial exploration program does not require any reclamation or remediation because of minimal disturbance to the ground. The amount of these costs is not known at this time because we do not know the extent of the exploration program we will undertake, beyond completion of the recommended exploration phases described above, or if we will enter into production on the property. Because there is presently no information on the size, tenor, or quality of any resource or reserve at this time, it is impossible to assess the impact of any capital expenditures on our earnings or competitive position in the event a potentially commercially-viable deposit is discovered. We have no employees as of the date of this report other than our president and CEO, Mr. Bygdnes. We conduct our business largely through agreements with consultants and other independent third party vendors. We do not anticipate hiring additional employees over the next twelve months. We have not incurred and do not anticipate incurring any expenses associated with environmental laws during the exploratory phases of our operations. We do not have any subsidiaries other than IRC Exploration Ltd.
We do not lease or own any real property other than our mineral claims. Our executive and head office is located at 100-11245 Valley Ridge Dr. N.W, Calgary, Alberta, Canada T3B 5V4. We believe our current premises are adequate for our current operations and we do not anticipate that we will require any additional premises in the foreseeable future. When and if we require additional space, we intend to move at that time. No matters were submitted to a vote of the Company's shareholders during the quarter ended July 31, 2009. As of July 31, 2009, we had 44,400,000 shares of our common stock issued and outstanding, held by 42 shareholders of record. The Company has not declared, or paid, any cash dividends since inception. We do not plan to declare any dividends in the foreseeable future. Nevada law prohibits our board from declaring or paying a dividend where, after giving effect to such a dividend, (i) we would not be able to pay our debts as they came due in the ordinary course of our business, or (ii) our total assets would be less than the sum of our total liabilities plus the amount that would be needed, if the corporation were to be dissolved at the time of distribution, to satisfy the rights of any creditors or preferred stockholders. We did not issue any unregistered securities during the quarter ended July 31, 2009. We generated no revenue for the period from June 4, 2008 (Date of Inception) until July 31, 2009. We do not anticipate earning revenues until such time that we exercise our option and enter into commercial production of the Queen Claim. We are presently in the pre-exploration stage of our business and we can provide no assurance that we will discover commercially exploitable levels of mineral resources on the Queen Claim, or if such resources are discovered, that we will enter into commercial production. We incurred operating expenses in the amount of $102,804 for the year ended July 31, 2009. These operating expenses consisted primarily of accounting and audit expenses of $32,397, legal fees of $27,442, management fees of $12,000 and mineral property exploration costs of $16,685. We incurred operating expenses in the amount of $111,893 for the period from June 4, 2008 (Date of Inception) through July 31, 2009. These operating expenses consisted primarily of accounting and audit expenses of $33,185, legal fees of $31,244, regulatory expenses of $4,000, mineral property exploration payments of $16,685, mineral property option cost of $3,717, management fees of $13,000, transfer agent and filing fees of $3,781 and foreign exchange loss of $3,280. We recorded a net loss of $102,804 for the year ended July 31, 2009 and $111,893 for the period from June 4, 2008 (Date of Inception) until July 31, 2009. Comparative figures for the years ended July 31, 2009 and 2008 are not presented as the Company was incorporated on June 4, 2008. As of July 31, 2009, we had total current assets of $8,014. We had $7,532 in current liabilities as of July 31, 2009. Thus, we had working capital of $482 as of July 31, 2009. Net cash used in operating activities were $107,086 and $105,361 for the year ended July 31, 2009 and for the period from June 4, 2008 (Date of Inception) to July 31, 2009, respectively. Our main source of cash was from the sale of our common stocks which generated $112,375 in cash flow to date since the date of our inception. We have not attained profitable operations and are dependent upon obtaining financing to pursue significant exploration activities beyond those planned for the current fiscal year. For these reasons, our auditors stated in their report to our audited financial statements for the period from June 4, 2008 (Date of Inception) to July 31, 2009 that they have substantial doubt we will be able to continue as a going concern. We will not be conducting any product research or development during the next 12 months. As July 31, 2009, there were no off balance sheet arrangements. As required by Rule 13a-15 under the Securities Exchange Act of 1934, we have carried out an evaluation of the effectiveness of our disclosure controls and procedures as of the end of the period covered by this annual report, being July 31, 2009. This evaluation was carried out under the supervision and with the participation of our management, including our President and Chief Executive Officer. Disclosure controls and procedures are controls and other procedures that are designed to ensure that information required to be disclosed in our reports filed or submitted under the Securities Exchange Act of 1934 is recorded, processed, summarized and reported, within the time periods specified in the Securities and Exchange Commission’s rules and forms. Disclosure controls and procedures include controls and procedures designed to ensure that information required to be disclosed in our company’s reports filed under the Securities Exchange Act of 1934 is accumulated and communicated to management, including our President and Chief Executive Officer, to allow timely decisions regarding required disclosure. Our management does not expect that our disclosure controls or our internal controls over financial reporting will prevent all error and fraud. A control system, no matter how well conceived and operated, can provide only reasonable, but no absolute, assurance that the objectives of a control system are met. Further, any control system reflects limitations on resources, and the benefits of a control system must be considered relative to its costs. These limitations also include the realities that judgments in decision-making can be faulty and that breakdowns can occur because of simple error or mistake. Additionally, controls can be circumvented by the individual acts of some persons, by collusion of two or more people or by management override of a control. A design of a control system is also based upon certain assumptions about potential future conditions; over time, controls may become inadequate because of changes in conditions, or the degree of compliance with the policies or procedures may deteriorate. Because of the inherent limitations in a cost-effective control system, misstatements due to error or fraud may occur and may not be detected. Based upon that evaluation, our President and Chief Executive Officer concluded that our disclosure controls and procedures were ineffective as of the end of the period covered by this annual report. Our management is responsible for establishing and maintaining adequate internal control over financial reporting (as defined in Rule 13a-15(f) under the Securities Exchange Act of 1934). Management has assessed the effectiveness of our internal control over financial reporting as of July 31, 2009 based on criteria established in Internal Control-Integrated Framework issued by the Committee of Sponsoring Organizations of the Treadway Commission. As a result of this assessment, management concluded that, as of July 31, 2009, our internal control over financial reporting was not effective. Our management identified the following material weaknesses in our internal control over financial reporting, which are indicative of many small companies with small staff: (i) inadequate segregation of duties and effective risk assessment; and (ii) insufficient written policies and procedures for accounting and financial reporting with respect to the requirements and application of both US GAAP and SEC guidelines. We plan to take steps to enhance and improve the design of our internal control over financial reporting. During the period covered by this annual report on Form 10-K, we have not been able to remediate the material weaknesses identified above. To remediate such weaknesses, we plan to implement the following changes during our fiscal year ending July 31, 2010: (i) appoint additional qualified personnel to address inadequate segregation of duties and ineffective risk management; and (ii) adopt sufficient written policies and procedures for accounting and financial reporting. The remediation efforts set out in (i) is largely dependent upon our securing additional financing to cover the costs of implementing the changes required. If we are unsuccessful in securing such funds, remediation efforts may be adversely affected in a material manner. This annual report does not include an attestation report of our registered public accounting firm regarding internal control over financial reporting. Management’s report was not subject to attestation by our registered public accounting firm pursuant to temporary rules of the Securities and Exchange Commission that permit our company to provide only management’s report in this annual report. On September 15, 2009, we filed a Certificate of Amendment with the Nevada Secretary of State in order to change our name to “Source Gold Corp.” and to increase our authorized capital stock from 100,000,000 shares to 200,000,000 shares. The total number of shares of common stock that we now have authority to issue is 180,000,000 shares and the total number of shares of preferred stock that we have authority to issue is 20,000,000 shares. Our Articles of Incorporation have been amended to reflect this name change and increase in authorized shares. A copy of the Certificate of Amendment is attached hereto as Exhibit 3.3 and is incorporated by reference herein. On September 15, 2009, we filed a Certificate of Change with the Nevada Secretary of State in order to implement a forward split of our common shares on the basis of 4 shares for every share issued and outstanding. The total number of authorized shares has not been changed by this action. A copy of the Certificate of Change is attached hereto as Exhibit 3.4 and is incorporated by reference herein. The following information sets forth the names of our current directors and executive officers, their ages as of July 31, 2009 and their present positions. Harry Bygdnes. Mr. Bygdnes is our CEO, CFO, President, Secretary, Treasurer and sole director. From June 2006 until the present time Mr. Bygdnes has been the President and Director of County Line Energy Corp., a Nevada corporation which owns oil and gas assets in Alberta. From September 2003 to June 2006, Mr. Bygdnes was retired. Mr. Bygdnes holds a BSc. in Physics and Mathematics from the University of British Columbia. We do not have an audit committee financial expert because of the size of our company and our board of directors at this time. We believe that we do not require an audit committee financial expert at this time because we retain outside consultants who possess these attributes. Based upon the board of directors’ review and discussion of the matters above, the board of directors authorized inclusion of the audited financial statements for the year ended July 31, 2008 to be included in this Annual Report on Form 10-K and filed with the Securities and Exchange Commission. As of July 31, 2009, we had not adopted a Code of Ethics for Financial Executives, which would include our principal executive officer, principal financial officer, principal accounting officer or controller, or persons performing similar functions. The Company has and will have the need for accounting, administrative, management, and corporate record-keeping services from time to time, but has determined that it is not cost effective to maintain the infrastructure associated therewith. Hence the company entered into a Corporate Management Services Agreement with Mr. Bygdnes whereby he has agreed to provide these services for us. In addition, Mr. Bygdnes holds substantial ownership in the Company and is motivated by a strong entrepreneurial interest in developing our operations and potential revenue base to the best of his ability. As our business and operations expand and mature, we may expand our compensation package designed to attract, retain and motivate talented executives. The table below summarizes all compensation awarded to, earned by, or paid to both to our officers and to our directors for all services rendered in all capacities to us for our fiscal years ended July 31, 2009, 2008 and 2007. Our named executive officer receives $1,000 per month with respect to a Corporate Management Service Agreement with the company. In addition he is entitled to be reimbursed for expenses incurred on behalf of the company. The table below summarizes all unexercised options, stock that has not vested, and equity incentive plan awards for each named executive officer as of July 31, 2009. We do not compensate our directors for their service at this time. We did not have a stock option plan in place as of July 31, 2009. On July 1, 2008, we entered into a Corporate Management Services Agreement with our President for Management Services. Pursuant to the agreement the President will receive $1,000 per month plus expenses for services rendered. The agreement may be terminated by either party upon 30 days written notice. As of the date of this annual report, our common stock is traded on the OTC Bulletin Board (the “Bulletin Board”). The Bulletin Board does not impose on us standards relating to director independence or the makeup of committees with independent directors, or provide definitions of independence. Incorporated by reference to the Registration Statement on Form S-1 filed with the Securities and Exchange Commission on October 7, 2008. We have audited the accompanying consolidated balance sheets of Source Gold Corp. (formerly Ibex Resources Corp.) (the “Company”) (An Exploration Stage Company) and its subsidiary as of July 31, 2009 and July 31, 2008 and the related statements of operations and comprehensive loss, cash flows and stockholders' equity for the year ended July 31, 2009, the period from June 4, 2008 (Date of Inception) to July 31, 2008 and for the period from June 4, 2008 (Date of Inception) to July 31, 2009. These financial statements are the responsibility of the Company's management. Our responsibility is to express an opinion on these financial statements based on our audits. In our opinion, the financial statements referred to above present fairly, in all material respects, the financial position of Source Gold Corp (formerly Ibex Resources Corp.) and its subsidiary as of July 31, 2009 and 2008 and the results of its operations and their cash flows for the year ended July 31, 2009, the period from June 4, 2008 (Date of Inception) to July 31, 2008 and for the period from June 4, 2008 (Date of Inception) to July 31, 2009, in conformity with accounting principles generally accepted in the United States of America. The accompanying consolidated financial statements referred to above have been prepared assuming that the Company will continue as a going concern. As discussed in Note 1 to the financial statements, the Company is in the exploration stage, has working capital which may not be sufficient to sustain operations over the next twelve months, has yet to achieve profitable operations, has accumulated losses since its inception and expects to incur further losses in the development of its business These factors, along with other matters as set forth in Note 1, raise substantial doubt that the Company will be able to continue as a going concern. The financial statements do not include any adjustments that might result from the outcome of these uncertainties. The Company was incorporated in the state of Nevada, United States of America on June 4, 2008. The Company is an exploration stage company and was formed for the purpose of acquiring exploration and development stage mineral properties. The Company’s year-end is July 31. On August 31, 2009, the Company changed its name to Source Gold Corp. in order to reflect the current focus of the Corporation. Effectively September 10, 2009, the Company increased the number of authorized common shares of the Company from 90,000,000 to 180,000,000 shares and its authorized preferred shares from 10,000,000 to 20,000,000 shares per director’s resolution dated August 31, 2009. The Company also conducted a four to one forward stock split of the Company’s issued and outstanding common shares per director’s resolution dated August 31, 2009. Following this stock split, the number of outstanding shares of the Company’s common stock increased from 11,100,000 shares to 44,400,000 shares. All share and per share information in these financial statements has been retro-actively restated for all periods presented to give effect of this stock split. During the year, the Company’s subsidiary acquired a mineral claim located in British Columbia, Canada. The Company intends on exploring its mineral property and has not yet determined the existence of economically recoverable reserves. The recoverability of amounts incurred on its mineral property is dependent upon the existence of economically recoverable reserves in the property, confirmation of the Company’s interest in the underlying mineral claims, the ability of the Company to obtain the necessary financing to complete their development, and the attainment and maintenance of future profitable production or disposition thereof. and repay its liabilities arising from normal business operations when they come due. Management has no formal plan in place to address this concern but considers that the Company will be able to obtain additional funds by equity financing and/or related party advances, however there is no assurance of additional funding being available or on acceptable terms, if at all. The financial statements of the Company have been prepared in accordance with accounting principles generally accepted in the United States of America and are stated in US dollars. Because a precise determination of many assets and liabilities is dependent upon future events, the preparation of financial statements for a period necessarily involves the use of estimates, which have been made using careful judgment. Actual results may vary from these estimates. These consolidated financial statements include the accounts of the Company and IRC Exploration Ltd., a wholly owned subsidiary incorporated in Canada on August 1, 2008. All significant inter-company transactions and balances have been eliminated. The Company is an exploration stage company as defined in the Statement of Financial Accounting Standard (“SFAS”) No. 7, “Accounting and Reporting By Development Stage Enterprises” and The Securities and Exchange Commission Exchange Act Guide 7. All losses accumulated since inception have been considered as part of the Company’s exploration stage activities. Cash consists of all highly liquid investments that are readily convertible to cash within 90 days when purchased. Costs of lease, acquisition, exploration, carrying and retaining unproven mineral lease properties are expensed as incurred. The Company’s functional currency is the Canadian dollar as substantially all of the Company’s operations are in Canada. IRC’s functional currency is the Canadian dollar. The Company uses the United States dollar as its reporting currency for consistency with registrants of the Securities and Exchange Commission (“SEC”) in accordance with the SFAS No. 52 “Foreign Currency Translation”. Assets and liabilities denominated in a foreign currency are translated at the exchange rate in effect at the balance sheet date and capital accounts are translated at historical rates. Income statement accounts are translated at the average rates of exchange prevailing during the period. Translation adjustments from the use of different exchange rates from period to period are included in the Accumulated Other Comprehensive Income account in Stockholder’s Equity, if applicable. Transactions undertaken in currencies other than the functional currency of the entity are translated using the exchange rate in effect as of the transaction date. Any exchange gains and losses are included in the Statement of Operations and Comprehensive Loss. The Company uses the asset and liability method of accounting for income taxes pursuant to SFAS No. 109 “Accounting for Income Taxes”. Under the assets and liability method of SFAS 109, deferred tax assets and liabilities are recognized for the future tax consequences attributable to temporary differences between the financial statements carrying amounts of existing assets and liabilities and loss carry-forwards and their respective tax bases. Deferred tax assets and liabilities are measured using enacted tax rates expected to apply to taxable income in the years in which those temporary differences are expected to be recovered or settled. The Company reports basic loss per share in accordance with SFAS No. 128, “Earnings Per Share”. Basic loss per share is computed using the weighted average number of shares outstanding during the period. Fully diluted earnings (loss) per share are computed similar to basic income (loss) per share except that the denominator is increased to include the number of common stock equivalents (primarily outstanding options and warrants). Common stock equivalents represent the dilutive effect of the assumed exercise of the outstanding stock options and warrants, using the treasury stock method, at either the beginning of the respective period presented or the date of issuance, whichever is later, and only if the common stock equivalents are considered dilutive based upon the Company’s net income (loss) position at the calculation date. Diluted loss per share has not been provided as it would be anti-dilutive. Under SFAS 130, “Reporting Comprehensive Income”, the Company is required to report comprehensive income, which includes net loss as well as changes in equity from non-owner sources. In December 2007, the FASB issued Statement of Financial Accounting Standards No. 141 (revised 2007), Business Combinations (“SFAS No. 141R”). This standard replaces SFAS 141 and establishes principles and requirements for an acquirer, recognizes and measures in its financial statement the identifiable assets acquired and liabilities assumed, any non-controlling interest in the acquiree, and the goodwill acquired. This standard also establishes disclosure requirements which will enable users to evaluate the nature and financial effects of the business combination. This standard is effective for financial statements issued for fiscal years beginning on or after December 15, 2008. The adoption of this statement did not have a material effect on the Company’s future reported financial position or results of operations. In March 2008, the FASB issued SFAS 161 “Disclosures about Derivative Instruments and Hedging Activities – an amendment of SFAS 133. This Statement requires enhanced disclosures about an entity’s derivative and hedging activities and thereby improves the transparency of financial reporting. This Statement is effective for financial statements issued for fiscal years and interim periods beginning after November 15, 2008, with early application encouraged. This Statement encourages, but does not require, comparative disclosures for earlier periods at initial adoption. The adoption of this statement did not have a material effect on the Company’s reported financial position or results of operations. In December 2007, the FASB issued Statement of Financial Accounting Standards No. 160, Non controlling Interests In Consolidated Financial Statements – an amendment to ARB No.51 (“SFAS No. 160”). This standard Amends ARB 51 to establish accounting and reporting standards for a non-controlling interest in a subsidiary and for deconsolidation of a subsidiary. This standard applies prospectively to business combinations for which the acquisition date is on or after the beginning of the first annual reporting period beginning on or after December 15, 2008. This standard may not be applied before that date. The Company is assessing the effect that the implementation of this new standard will have on the financial statements. In June 2008, the FASB ratified EITF Issue No. 07-5, Determining Whether an Instrument (or an Embedded Feature) is Indexed to an Entity’s Own Stock (“EITF 07-5”). EITF 07-5 provides that an entity should use a two step approach to evaluate whether an equity-linked financial instrument (or embedded feature) is indexed to its own stock, including evaluating the instrument’s contingent exercise and settlement provisions. It also clarifies on the impact of foreign currency denominated strike prices and market-based employee stock option valuation instruments on the evaluation. EITF 07-5 is effective for fiscal years beginning after December 15, 2008. The Company does not expect the implementation of this new standard will have on the financial statements. In June 2009 the FASB issued SFAS No. 168 “The FASB Accounting Standards Codification and the Hierarchy of Generally Accepted Accounting Principles—a replacement of FASB Statement No. 162” The FASB Accounting Standards Codification (Codification) will become the source of authoritative U.S. generally accepted accounting principles (GAAP) recognized by the FASB to be applied by nongovernmental entities. Rules and interpretive releases of the Securities and Exchange Commission (SEC) under authority of federal securities laws are also sources of authoritative GAAP for SEC registrants. On the effective date of this Statement, the Codification will supersede all then-existing non-SEC accounting and reporting standards. All other nongrandfathered non-SEC accounting literature not included in the Codification will become nonauthoritative. This Statement is effective for financial statements issued for interim and annual periods ending after September 15, 2009. The Company has adopted this standard in the current year. Please see Note 3 for details. In June 2009 the FASB issued SFAS No. 167 “Amendment to FASB Interpretation No. 46(R)”. The objective in issuing this Statement is to improve financial reporting by enterprises involved with variable interest entities. The Board undertook this project to address (1) the effects on certain provisions of FASB Interpretation No. 46 (revised December 2003), Consolidation of Variable Interest Entities, as a result of the elimination of the qualifying special-purpose entity concept in FASB Statement No. 166, Accounting for Transfers of Financial Assets, and (2) constituent concerns about the application of certain key provisions of Interpretation 46(R), including those in which the accounting and disclosures under the Interpretation do not always provide timely and useful information about an enterprise’s involvement in a variable interest entity. This Statement is effective as of the beginning of each reporting entity’s first annual reporting period that begins after November 15, 2009, for interim periods within that first annual reporting period, and for interim and annual reporting periods thereafter. Earlier application is prohibited. The Company is assessing the effect that the implementation of this new standard, if any, will have on the financial statements. In June 2009 the FASB issued SFAS No. 166 “Accounting for Transfers of Financial Assets—an amendment of FASB Statement No. 140”. The objective in issuing this Statement is to improve the relevance, representational faithfulness, and comparability of the information that a reporting entity provides in its financial statements about a transfer of financial assets; the effects of a transfer on its financial position, financial performance, and cash flows; and a transferor’s continuing involvement, if any, in transferred financial assets. The Board undertook this project to address (1) practices that have developed since the issuance of FASB Statement No. 140, Accounting for Transfers and Servicing of Financial Assets and Extinguishments of Liabilities, that are not consistent with the original intent and key requirements of that Statement and (2) concerns of financial statement users that many of the financial assets (and related obligations) that have been derecognized should continue to be reported in the financial statements of transferors. This statement must be applied as of the beginning of each reporting entity’s first annual reporting period that begins after November 15, 2009, for interim periods within that first annual reporting period and for interim and annual reporting periods thereafter. Earlier application is prohibited. The Company is assessing the effect that the implementation of this new standard will have on the financial statements. We adopted SFAS No. 157 on August 1, 2008 for all financial assets and liabilities and nonfinancial assets and liabilities that are recognized or disclosed at fair value in the financial statements on a recurring basis (at least annually). SFAS No. 157 defines fair value, establishes a framework for measuring fair value, and expands disclosures about fair value measurements. SFAS No. 157 defines fair value as the price that would be received upon sale of an asset or paid upon transfer of a liability in an orderly transaction between market participants at the measurement date and in the principal or most advantageous market for that asset or liability. The fair value should be calculated based on assumptions that market participants would use in pricing the asset or liability, not on assumptions specific to the entity. In addition, the fair value of liabilities should include consideration of non-performance risk including our own credit risk. Level 1 – inputs are based upon unadjusted quoted prices for identical instruments traded in active markets. Level 2 – inputs are based upon quoted prices for similar instruments in active markets, quoted prices for identical or similar instruments in markets that are not active, and model-based valuation techniques for which all significant assumptions are observable in the market or can be corroborated by observable market data for substantially the full term of the assets or liabilities. Level 3 – inputs are generally unobservable and typically reflect management’s estimates of assumptions that market participants would use in pricing the asset or liability. The fair values are therefore determined using model-based techniques that include option pricing models, discounted cash flow models, and similar techniques. The carrying value of the Company’s financial assets and liabilities which consist of cash, accounts payable and accrued liabilities and promissory note payable, in management’s opinion approximate their fair value due to the short maturity of such instruments. There financial assets and liabilities are valued using level 1 inputs. Unless otherwise noted, it is management’s opinion that the Company is not exposed to significant interest, exchange or credit risks arising from these financial instruments. The amount due to related party is due to the Company’s president for unpaid management fees of $1,000 (2008: unpaid management fees of $1,000 and cash advances of $1,200). These amounts are unsecured, non-interest bearing and have no specific terms for repayment. On June 16, 2008 the Company received and accepted a subscription to purchase 24,000,000 common shares at $0.002 per share for aggregate proceeds of $48,000 from Company’s president. The subscription agreement permitted the Company to accept US$48,000 or CDN$48,000 in full settlement of the share subscription. The share subscription was settled in Canadian dollars. On June 16, 2008 the shares were issued. On June 16, 2008, the Company issued 24,000,000 common shares to the Company’s president at $0.002 per share for total proceeds of $48,000. At July 31, 2009, the Company has incurred accumulated net operating losses in the United States of America totalling approximately $92,000 which are available to reduce taxable income in future taxation years. The amount taken into income as deferred tax assets must reflect that portion of the income tax loss carryforwards that is more-likely-than-not to be realized from future operations. The Company has chosen to provide an allowance of 100% against all available income tax loss carryforwards, regardless of their time of expiry. The Company has adopted FASB Interpretation No. 48, "Accounting for Uncertainty in Income Taxes" ("FIN 48"). FIN 48 prescribes a recognition threshold and measurement attribute for the recognition and measurement of tax positions taken or expected to be taken in income tax returns. FIN 48 also provides guidance on de-recognition of income tax assets and liabilities, classification of current and deferred income tax assets and liabilities, and accounting for interest and penalties associated with tax positions. The Company files income tax returns in the U.S. federal jurisdiction, various state and foreign jurisdictions. The Company’s tax returns are subject to tax examinations by U.S. federal and state tax authorities, or examinations by foreign tax authorities until respective statue of limitation. It is subject to tax examinations by tax authorities for all taxation years commencing on or after 2008. Management’s analysis of FIN 48 supports the conclusion that the Company does not have any accruals for uncertain tax positions as of July 31, 2009. As a result, tabular reconciliation of beginning and ending balances would not be meaningful. If interest and penalties were to be assessed, we would charge interest to interest expense, and penalties to other operating expense in the period of the assessment. It is not anticipated that unrecognized tax benefits would significantly increase or decrease within 12 months of the reporting date. The Company estimated the expected amount of loss carry forwards available. The Company expects to have significant net operating loss carry forwards for income tax purposes available to offset future taxable income. On July 1, 2008, the Company entered into a Corporate Management Services Agreement with the Company’s president for Management Services. Pursuant to the agreement the President will receive $1,000 per month plus expenses for services rendered. The agreement may be terminated by either party upon 30 days written notice. CDN$50,000 ($46,045) on or before July 31. 2010. Exploration expenditures of $14,157 (CDN$15,000) on or before July 31, 2009 (expenses incurred), $28,833 (CDN$31,000) in aggregate on or before July 31, 2010; $222,222 (CDN$241,000) in aggregate on or before July 31, 2011. Upon earning its 85% interest in the option, the Company shall enter into a joint venture agreement to develop and operate the property. Pursuant to a promissory note dated July 31, 2009, the Company promised to pay the owner of the “Queen” claim $1,842 (CND$2,000) Note 7. The note is unsecured, non-interest bearing, and is due on or before January 31, 2010.